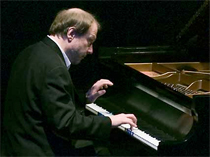 Pianist Marc-André Hamelin’s unique blend of musicianship and virtuosity brings forth interpretations remarkable for their freedom, originality, and prodigious mastery of the piano’s resources. Long known for his bold exploration of unfamiliar pianistic terrain, Mr. Hamelin has increasingly turned his attention to the established masterworks of the piano literature, in performances and recordings of the piano sonatas of Haydn, major works by Mozart, Schumann, Brahms, Chopin and others. Highlights of recent seasons include a string of critically acclaimed appearances with the symphony orchestras of Boston, Minnesota, Indianapolis and San Francisco; a series of dates at New York City’s Lincoln Center – with Louis Langrée and Mostly Mozart Festival Orchestra, in recital for the “Great Performers” series, in chamber concerts with Midori, and playing Haydn and Mozart concerti with Sir Neville Marriner and the Academy of St. Martin the Fields; an international tour and subsequent recording of the Schumann Piano Quintet with the Takács String Quartet; and the Pro Musica Society of Montreal’s celebration of “The Art of Marc-André Hamelin” featuring a weeklong series of instrumental and vocal chamber music concerts, a solo recital and Beethoven and Haydn concerti. Under exclusive contract with Hyperion Records, Mr. Hamelin has received nine Grammy nominations, including a 2010 nomination for a disc of Hamelin’s own compositions, Etudes and other works. His complete Hyperion discography numbers more than forty albums, and includes concertos and works for solo piano by composers such as Alkan, Busoni, Godowsky, and Medtner, as well as brilliantly received performances of Brahms, Chopin, Haydn, Liszt and Schumann. Mr. Hamelin was recently presented with a lifetime achievement prize by the German Record Critic’s Award (Preis der deutschen Schallplattenkritik) and was made an Officer of the Order of Canada in 2003 and a Chevalier de l’Ordre du Québec in 2004; he is also a member of the Royal Society of Canada. He makes his home in Boston.